Chance Adams may now be a starting pitcher, but he hasn't exactly left his dogged approach in the bullpen. "I've had the same mentality as I do now that I had as a reliever, I literally just go in and try to strike out as many guys as possible," New York's No. 21 prospect said. "As a starter, you really need to build a routine, so I'm trying to stick with that. You work for those four days, and on that fifth day, you get to pitch and have fun. Working hard those four days and staying focused is helping me get ready for the long season." 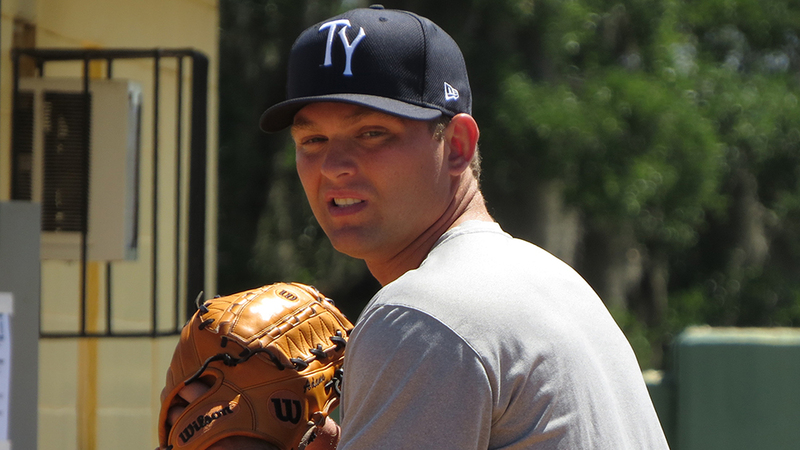 In his sixth start of 2016, Adams (2-0) scattered three hits and struck out a career-high eight batters over six scoreless innings as Class A Advanced Tampa defeated Clearwater, 4-0, at George M. Steinbrenner Field on Saturday. The 21-year-old right-hander worked a 1-2-3 first inning before MLB.com's No. 27 overall prospect Jorge Mateo gave him early run support. The top Yankees prospect led off the bottom of the frame with a liner down the left-field line and raced around the bases for an inside-the-park home run. Mateo belted an RBI triple to left in the fifth and singled to center in the seventh. "Having a guy like Mateo, who makes some nice plays behind you and then does some big things is fun," Adams said of his 20-year-old teammate. "When he hits a single, you say, 'Well, that's a double' because you just know he's going to swipe that next bag." Meanwhile, the Arizona native spotted a trend in the Threshers' hitters approach. Adams didn't fan anyone in the first, but made an adjustment on the fly and recorded five of his next six outs by strikeout. "I noticed after the first inning that they were kind of sitting on the fastball," he said. "So I decided that I was going to mix things up for the rest of the game. My changeup was a big help for me. I haven't been able to locate it that well in the first few starts. but today. I felt comfortable with it. We kept going to it on good fastball counts to keep them off balance and it really worked. Usually I get a lot of my strikeouts with my fastball, but this outing I got most of my strikeouts with a mixture between all four of my pitches." The 6-foot, 215-pound hurler threw 56 of 85 pitches for strikes, and after having allowed four home runs in his first two outings, didn't give up a long ball for the third consecutive start. "The biggest part of keeping the ball in the park is that my velocity has been picking up and it's about where it was last year," Adams said. "My arm takes a little bit of time to get back up to its full potential. Being able to throw my slider in good counts." The Dallas Baptist University product prides himself on remaining on an even keel and learning from his early mistakes. "You're not going to be your best every single game," Adams said. "In that first start, I gave up two home runs on changeups that I didn't throw in good counts and it wasn't fully there. I've been working hard on that pitch because everyone always says that's a big plus-pitch to have as a starter. The pitching coordinators have helped me develop it to what it was tonight." Philip Walby, Caleb Frare and James Reeves worked a scoreless inning apiece to complete to the shutout.